David and Linda Headley moved into their home in Smithfield, PA in 2006. Shortly thereafter, Atlas Energy began drilling and fracking on their land. The results have been a nightmare. Their water has been contaminated. The stream on their property can be set on fire. Their horses have gotten sick and one has gone partially blind. Their dog had to be rescued from a sludge pond on their property. The family has experienced illness. They have been fighting for their land and fighting with the industry ever since the companies first showed up on their land, but their struggle now has reached a new level of absurdity. The company has now locked the gate that crosses the only usable driveway onto the Headleys’ property. The gate which had previously given access to both the Headleys and the industry is now locked with a chain that only provides room for one padlock, the industry’s. When the Atlas workers came by to conduct the most recent blowdown, Dave Headley said he went over to tell them to stop. His 4-year-old son was outside in the yard, and his 17-year-old son was about 100 feet away, chopping wood, he said. Dave Headley said he received no warning or advisement that the blowdown was about to occur. “If it was your children, you wouldn’t let them play in it either,” Dave Headley said he told the workers. 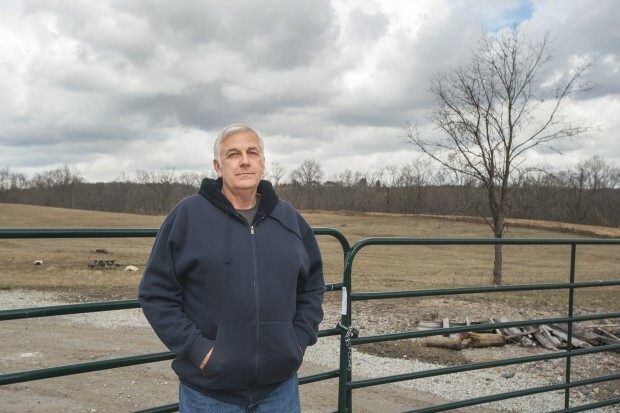 A state police trooper visited later to tell Dave Headley not to harass the workers, and not long after that, the Atlas workers came back to put a lock the gate, Dave Headley said. This time, however, there was only one break in the chain — for the Atlas lock — and there was no way for the Headleys to put their own lock on the chain as they had in the past, he said. As Linda Headley stated at the PA Harmed by Fracking press conference this past January, the Headleys are one of many PA residents who have been ignored, lied to, or dismissed by the Department of Environmental Protection (DEP). They are also being ignored by workers on their own property. David’s attempts to talk to workers about the locked gate were futile. That’s the question Dave Headley asked a worker from Atlas Resource Partners, the company who owns a deep Marcellus shale gas well on his property. The worker, Headley said, secured the gate at the end of the driveway leading to the Headleys’ house with a padlock wrapped in barbed wire. He got no response from the man on the other side of the gate. Terrible story! What can we do to help? Unfortunately, I can not afford to make a donation. A quick approach to temporarily restore flow is to vent the well to the atmosphere (well “blowdown”), which produces substantial methane emissions. outrageous ! who can help them in our government and regulatory agencies and legal system? Tam, the key differences in technological terms between fracturing decades ago and fracking in the Marcellus Shale are that this is high-volume slickwater hydraulic fracturing on multi-well pads using long laterals (horizontal drilling). It uses vast amounts of water (avg 4.7 million gallons instead of 80,000 gallons… per frack, per well). It uses not just more intense chemicals but lots more of those chemicals — “Slickwater” — fracking workers say they use two truck tankloads of sulfuric acid alone, per frack, for example; and estimated average of 44,000 pounds of chemicals per frack. High-volume means high-pressure, which increases the incidence of intense accidents like blowouts. Multi-well pads means that each well pad is the site of multiple wells, which increases the volume, scale and scope of chemicals (drilling chemicals, diesel fuel, fracking chemicals, and flowback including radioactive materials, arsenic, barium, lead, etc.) spilling and spewing at each well pad. Long laterals, or horizontal drilling, is what requires more volume, more pressure, more chemicals, more water, and increases the unbelievable amount of deadly chemicals being injected underground. But there are many more differences politically, as well as differences in the overall scale of destructiveness of the whole industry because of the fact that they never just “frack a little bit” — so their separators, dehydrators, flowback waste problems, compressor stations, pipelines and more accumulate devastating impacts on land, air and water while they continue to deny, obfuscate, confuse, and all while remaining exempt from the major federal environmental laws which would otherwise enable EPA to regulate and curb some of their worst practices (like their practice of labeling radioactive toxic waste as “residual” instead of “hazardous.”). To learn more, go to “Search” on this blog (top right corner). Type in “Ingraffea” and watch one or two of his lectures. But as the Headleys’ experience demonstrates, the on-the-ground experience of having your lives turned upside down, your water poisoned, and your property made into an industrial zone while your right to a peaceful, safe and healthy life is taken away and you are humiliated on your own land — is beyond the bearable. So when you add in the arrogance of this industry and its ability to fracture our communities, the impact is further intensified. Thanks for paying attention and for standing up for ecological integrity and for human rights.